Exotic Ransomware belongs to the category of malware that is considered to be one of the most dangerous. Of course, it is known to be an extremely harmful computer infection not without reason. It has been found that this computer infection immediately encrypts users’ personal files stored in the %USERPROFILE% directory, including those having the .exe filename extension (only some ransomware infections encrypt those files). 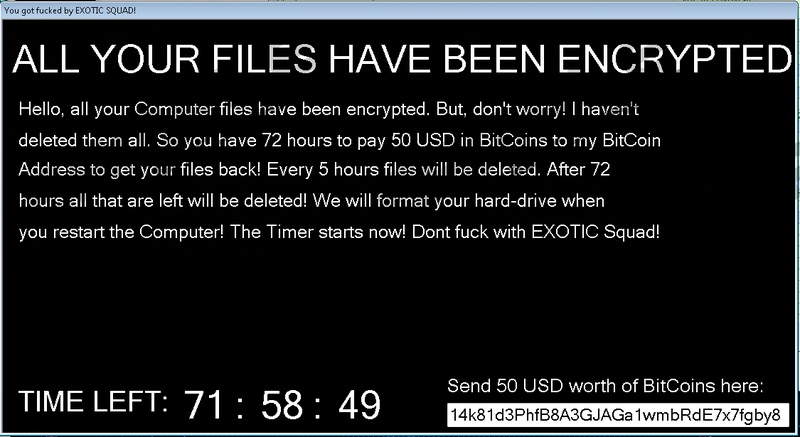 Cyber criminals are well aware that users will do anything to get their files back, so Exotic Ransomware is programmed to open a window with the ransom note right after the encryption process finishes. If you already see the black window with the ransom note, you already know that cyber crooks want only one thing from users in exchange for the decryption tool – money. Malware specialists working at pcthreat.com are strictly against any payments to cyber criminals. Do you want to find out why it is so? Continue reading this article. It is very likely that you will make a decision to remove Exotic Ransomware from your computer as soon as possible after reading this report. If it is true, you are welcome to use the removal instructions (you will find them below this article) to get rid of Exotic Ransomware. As research has revealed, if a user gets infected with Exotic Ransomware, its executable file (it might have a name Microsoft Audiodriver.exe to hide itself from the users’ eyes) is immediately dropped in %APPDATA%\Microsoft\Windows\Start Menu\Programs\Startup. Fortunately, it works from there and does not make many modifications on the computer it infects. Even though Exotic Ransomware enters computers secretly, you will find out quickly that it is inside your system because it will encrypt your important files within seconds by appending the new filename extension .exotic to all of them (yes, the ransomware is named after the extension it uses). The names of all the files will be changed as well, for example, you will see 0E%0N.exotic instead of picture.jpg. Once it finishes encrypting users’ files, it immediately opens a pop-up window with the short message (see below). It informs users that Exotic Ransomware is inside the computer, and it warns them not to try to kill the ransomware process or delete it. When users click OK to close this pop-up window, a black window containing the ransom note is opened for them. It has all the necessary information about the decryption of files. The ransom note tells what users have to do in order to get their files back. It is said that they have to pay 50 USD in Bitcoins to the address 14k81d3PhfB8A3GJAGa1wmbRdE7x7fgby8 (the same address is given to all the victims). This has to be done within 72hours; however, it is recommended to make a payment as soon as possible because several files will be deleted every 5 hours. We know that users have a bunch of important files stored on their computers, so we are sure that many people will make a decision to pay money. To be frank, it is not very smart to transfer money because it is very likely that cyber criminals do not even store those unique keys that can decrypt files on the server of Exotic Ransomware. In other words, it is very true that you will not get anything from cyber criminals even though you make a payment. Unfortunately, at the time of writing, it is impossible to unlock files having the .exotic extension freely, but it is very likely that the free tool will be developed one day, so do not hurry to delete those encrypted files. Many users cannot understand how Exotic Ransomware has sneaked onto their computers, and it is not surprising at all that they do not know anything about that. One thing is clear – ransomware infections enter computers without permission; however, they might find different ways to do that, for example, they might be dropped by Trojans, enter from spam emails, or find other security loopholes. In the case of Exotic Ransomware, it is very likely that cyber criminals spread it as a spam email attachment. Of course, nothing would have happened if you did not download an attachment, so it can be said that users, in most cases, contribute to the entrance of ransomware as well. If you wish to protect your PC from dangers, ignore all the spam emails you receive and install a reputable security application to be safe 24/7 ASAP. As Exotic Ransomware blocks the Task Manager, it will not be that easy to delete this ransomware infection. To make it disappear, you have to boot into the Safe Mode with Networking and then delete its executable file manually or download an automatic malware remover, such as SpyHunter, and launch it to eliminate Exotic Ransomware in an automatic way. No matter which method you employ, make sure that you fully delete this threat if you do not want to see your new files encrypted again. Start tapping F8 immediately after the computer is restarted. Select Safe Mode with Networking using arrow keys from the Advanced Boot Options menu. At the login screen, hold down the Shift key and click Power. Tap F5 or the number 5 on your keyboard to enable the Safe Mode with Networking. Locate the .exe file, e.g. Microsoft Audiodriver.exe. Quick & tested solution for Exotic Ransomware removal.